One night only – they bury us in the morning. That’s right. The Earth has completed yet another circle around the Sun God and he demands his offerings of fruit juices and rum. 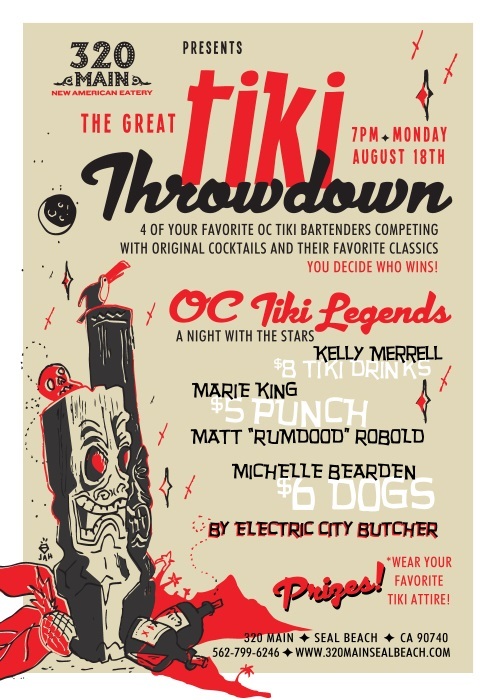 This year we’re doing it more OC style with myself, Kelly Merrell from Trader Sam’s, Michelle Bearden from 320 Main (who has taken over the Tiki Tuesday nights), and Marie King (formerly of Don The Beachcomber in Huntington Beach – now of Tonga Hut in Hollywood and Palm Springs – we’ll still consider her OC for thematic purposes). Hot dogs, original cocktails, and a few classics. I’m sure there are other things you could want, but I can’t think of what any of them would be. SoCal is having all the Tiki fun this weekend. Would love to be down there. Shooting for next year!